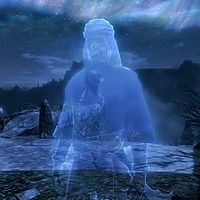 Azzadal is the ghost of a Redguard bard who can be met after jumping from Bard's Leap Summit. If the jump is successfully completed, Azzadal will appear and say: "Been a long time since someone took the leap. Longer still since any survived it. I once performed the entirety of the Poetic Edda from atop Bard's Leap before trying my luck. Well, you can see how that turned out." After his dialogue, he will play a song and you will receive two points to your speech skill. He wears full Hammerfell garb, including an Alik'r hood and a pair of Redguard boots. He carries a scimitar. This page was last modified on 16 April 2014, at 14:35.